The story of Cygnet Bay Pearls is a rare and fascinating tale that began three generations ago with entrepreneur and founder, Dean Brown. It was 1946 and navigating the pristine Kimberley coastline in a wooden lugger, Dean discovered the secluded, unspoilt beauty of Cygnet Bay along with the precious gift of the Pinctada Maxima pearl shell. It was in these waters that his pearling dream was realised in the creation of the first Australian owned and run South Sea pearl farm. 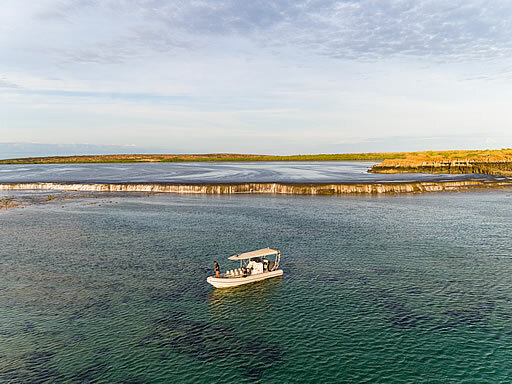 With an immense respect and connection to this sea, the Brown family are proud custodians of their grandfather’s 70 year legacy, running one of only three commercial pearl farms still operating in Western Australia. Broome’s history begins in the 1880’s with the discovery of the natural oyster beds of the species, Pinctada Maxima, along the northern Western Australian coast line. This oyster is the largest oyster in the world and has a beautiful thick and lustrous shell, which made it a valuable textile during this time. Broome boomed on the back of this industry boasting some 400 boats at its peak. However, plastics did arrive in force post second world war and replaced mother of pearl (MOP) shell as a textile, sending the industry into decline. In this next video James Brown, Managing Director of Cygnet Bay Pearls and third generation pearler, introduces the start of the Australian pearling industry. In 1946 our founder Dean Brown bought himself a lugger and headed to the Kimberley to seek his fortune. His timing was not great and he scratched out a living as best he could. Often fortune favours the brave and an opportunity came along that would change the course of Dean Brown’s life and the generations to come. The year is 1960 and the first trial harvest of cultured pearls is in – Cygnet Bay Pearls has chartered a new course in pearling. From bark huts and handmade tools, the story of Australia’s cultured pearling pioneers has begun. Up until this moment it was only the Japanese that had the expertise to successfully culture pearls. No farm in the world had ever been started without Japanese involvement. That just changed thanks to the Browns and their passionate dedication to a quest that was considered virtually impossible. Imagine the feeling of elation that must have swept through them as they saw those first few pearls from the Mother of Pearl oysters that had nurtured them. A moment of pure ecstasy, followed by the deep contemplation of “can we do it again?” It was the start of the long and difficult journey of Cygnet Bay becoming one of the world’s premier pearl farms. Once Dean’s son, Lyndon Brown, had mastered the art, he shared the secret of pearl cultivation with his dedicated and talented work mates. The first were local Bardi men, Aubrey Tigan, Tom Wiggan and Gordon Dixon. A pivotal point in time of global significance, as the ‘magical’ process of growing these valuable gems was only known to select Japanese technicians, one white Australian and three Australian indigenous men. Dean and Lyndon were soon joined by Dean’s youngest son Bruce and the three of them set about forging a business out of bark huts, pindan and the azure waters of Cygnet Bay. And so the face of Australian pearling was changed forever. In the decades that followed the Browns were instrumental in not just developing their own business, but also paving the way for a whole new modern Australian industry. In the 70’s they helped introduce the first modern diving equipment to the W.A. pearling fleet along with the first high-tech fibreglass pearling lugger. If you’re a Broome aficionado and familiar with Shinju Matsuri Festival, Australia’s festival of the pearl, the first Shinju Queen was adorned with pearls donated by Cygnet Bay Pearls. Around that time, Cygnet Bay Pearls opened Broome’s first cultured pearl shop. The name Brown may not come to mind like Paspaley or Kailis when it comes to Australian pearling, but that is often the way with humble Australian pioneers. The Browns dedicated themselves to a deeper understanding of pearling, the environment, creating a beautiful pearling village, which boasted a public school, weather station, grass tennis court and store, and the pursuit of the perfect pearl. After nearly half a century and the hard work and dedication of three generations of the Brown family to Cygnet Bay, the pearling industry had reached incredible heights. By the early 2000’s, Cygnet Bay was producing one of the rarest and most valuable pearl harvests in the world, which was quickly snapped up by international wholesale markets. 2004 was no different, except among the extraordinary harvest there lay one exceptional piece. An enormous pearl – near golf ball size with all the desired hallmarks of a ‘perfect pearl’: a pink hue and near perfect clean lustrous white skin. It may just be the largest fine quality round pearl in the world. The Brown’s tireless pursuit is reflected in this one piece – the epic path to pearling perfection and its rarity and beauty reflect the blood, sweat, tears and joy of all that played a part in the Cygnet Bay story. Now the family proudly displays this priceless pearl to the public in their China Town showroom as a flagship piece and a reminder to all of just how far the Australian industry has come. In the early 2000’s, some 17 independent pearl producers plied the Kimberley coast. But the economics of pearling was about to shift. The Global Financial Crisis devastated wholesale pearl prices and within a few years only three pearl producers were left in Western Australia: Cygnet Bay Pearls, Paspaley and Clipper Pearls. In 2009, Cygnet Bay Pearls opened its doors to the public, inviting them to not only discover what it takes to run a pearl farm but, in another industry first, gave people the opportunity to view and purchase pearls directly from the waters in which they were nurtured. All with the background of the extraordinary Kimberley coast. It is still today the only commercial pearl farm open to the public and has invested in tourism facilities including, safari tents with ensuite, renovated historically listed pearlers shacks, a licenced restaurant with sweeping verandas and an infinity edged pool overlooking the beautiful bay where this remarkable story unfolded. The Browns have also developed the Kimberley Marine Research Station (KMRS), the only dedicated marine research station in the Kimberley. It is the only independently funded marine research station in Australia and helps scientists better understand one of the last virtually untouched marine wildernesses left on earth. 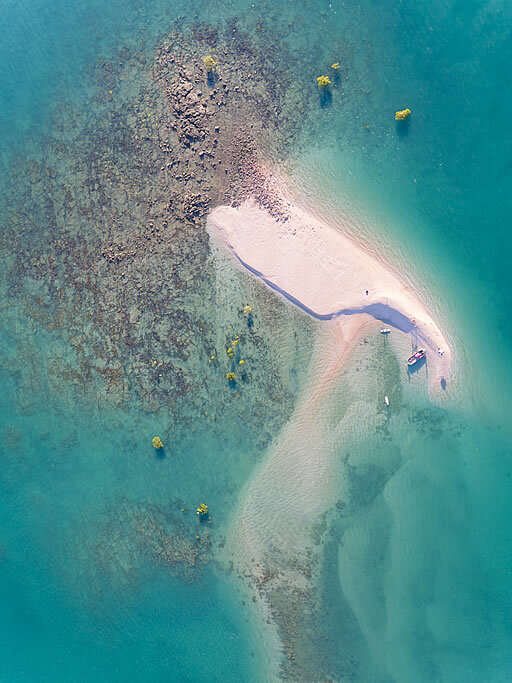 Their passion for the marine environment and their desire to tell the entire pearling story has led to the development of a range of marine eco-tours that showcase unique aspects of the Kimberley coast. The Giant Tides Sea Safari let’s you ride the world’s fastest ocean currents generated by the enormous tides. These tides are the beating heart of the Kimberley coast and the force of nature that powers the pearl farm. If you plan your trip well you can even witness a literal waterfall in the ocean on the farm’s Waterfall Reef tour. An experience so bizarre it has to be seen to be truly appreciated, something that only occurs in the Kimberley and should be on everybody’s bucket list. As part of 2016’s 70th anniversary celebrations, Cygnet Bay Pearls created a range of new experiences for you and built new shops in Broome’s famous China Town pearl strip of Dampier Terrace. The ‘state of the art’ new showroom is filled with an exquisite new jewellery range, of course, featuring the world’s highest quality Australian pearls and an ‘in Broome, farm experience’ where you can see the tools of the modern pearling trade and hear more about this incredible Australian story. The art of cultured pearling has come a long way, but so have other innovations, such as hatchery techniques, that have allowed other parts of the world to culture pearls in the absence of an abundant natural oyster population. The following video introduces the techniques of cultured pearling and why a pearl from Cygnet Bay on the Kimberley coast is still today a wonder of nature. Our guarantee is simple. Every pearl we sell comes from our farm at Cygnet Bay. You will receive a certificate stating your pearl’s origin and grade, along with information about your pearl’s setting. The precious gift of a Cygnet Bay Pearl is not only a pearl from an environmentally sound and sustainable process but also represents a piece of Australia’s pearling heritage.